Back in the day (when I had a manual typewriter), I always kept a few sheets of address labels handy. When I needed a mailing label for an envelope or package, I would just roll the sheet into the typewriter, type the address, and slap the label onto the package. But nowadays, who has a manual typewriter? Sheets of labels (with some of the labels used and missing) don't go through inkjet or laser printers very well. My laser printer can handle running #10 envelopes through it, but the envelopes tend to get wrinkled and the adhesive on the flap tends to get sealed by the heat of the printer. Also, I really needed a convenient way to label things besides just envelopes. File folders. Boxes of stuff in my supply closet. That sort of thing. So I bought myself a Dymo LabelWriter 450. I also bought a box of standard (envelope-size) address labels, a box of large address labels for shipping packages, and a box of file folder labels. When the LabelWriter first arrived, I didn't have anything that needed to be mailed, so I went to town labeling my file folders. Not all my file folders; I've got stuff going back years in one filing cabinet. I only bothered with the most commonly used files in my everyday lateral filing cabinet. Wow, what a difference it makes! I can now easily find any file folder in there. They're all neatly labeled and easy to identify: Medical, taxes, brokerage, invoices that I've sent out to clients, bank statements..... All readily identifiable at a glance. The print driver software from Dymo is available for both Mac and PC, and I can print to it from my Mac or from within Windows running within Parallels on my Mac. Yay for Dymo for remembering us Mac users! 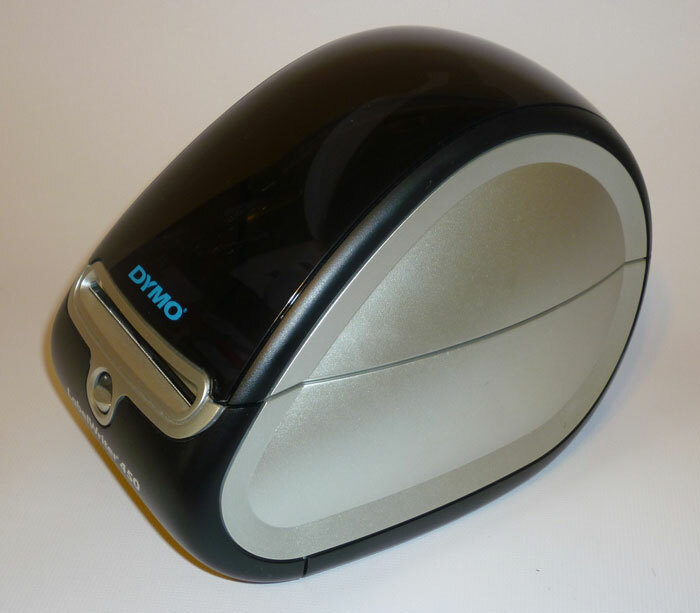 Printing to the Dymo Labelwriter is easy, painless and fast. The label comes out within about a second of hitting the Print button. You can add logos or other graphics to your labels, and you can save your preferred formats for the different label sizes. Using the Dymo is ever so much faster than printing directly on envelopes, and it's way faster than the old manual typewriter method. Swapping out different rolls of labels is easy, but getting the end of the new roll to feed properly into the LabelWriter is touchy. The one thing I dislike about it is that changing out the rolls to use a different size label is something of a PITA. Physically removing one roll and replacing it with a different roll is easy-peasy, but getting the leading end of the new roll to feed into the Labelwriter is touchy at best. I usually have to try it several times before the Labelwriter grabs the end and pulls it in. Feeding in the end at a very slight angle seems to help. The rolls of labels aren't very expensive; I'm not a frequent mailer, so I'm still on my first rolls of both sizes of mailing labels. I've used the file folder labels for stuff besides file folders, and I'm still on the first roll of those too. Labels are available in a wide variety of different sizes and shapes: You can make address labels in a lot of different sizes including large bar-coded labels, name tags, appointment/business card labels. You can get clear and colored labels. 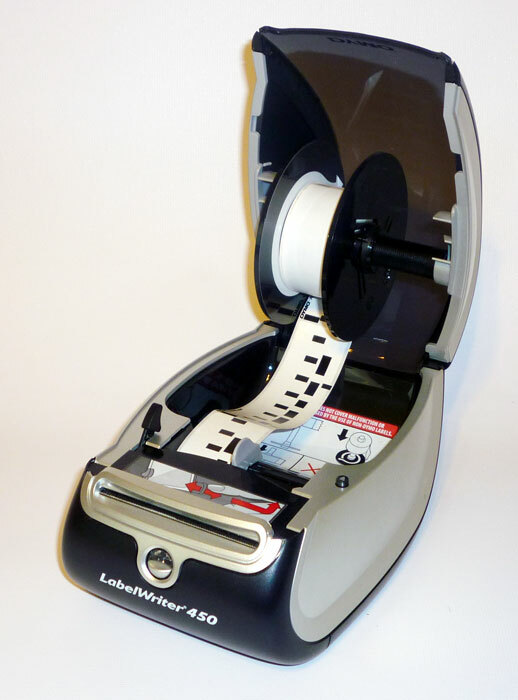 There's a large-format LabelWriter that lets you print 4"x6" labels, and a dual LabelWriter that holds two different size rolls, so there's less swapping of label rolls. I don't begin to use all the features offered by the LabelWriter. I don't do barcoding, but it has that capability. With a Stamps.com account, most of the LabelWriters will let you print your shipping labels with the postage already applied. You can print labels directly out of Word, Excel, Outlook and other programs. I can't speak to how well all of that actually works, since I just don't use any of those features. The Labelwriter uses thermal printing, so there's no purchasing expensive inks or toners, and it prints clear and sharp. And I can report that it's sturdy. A few weeks ago when I was needing to move stuff around to get behind my computer, I accidentally dropped the LabelWriter about 4 feet onto the hard floor. It still works like a champ. I've got plastic boxes on the top shelf in my office supply cabinet that hold things like spare USB & Ethernet cables, letter & legal size hanging file folders, and a variety of other supplies. They're all neatly labeled now, so I can go right to the box I need. I've got a variety of things around the house labeled: In my pantry, my utility room, my office, my kitchen. Any business would benefit from having a LabelWriter, but I'm betting most households would too. It's shocking how many things I discovered would benefit from a label once it was this fast and easy to create a label.